Jaclyn and Steve’s wedding is just around the corner – YAY! I can’t wait! I’m so excited! I was looking back at their incredibly stylish Wasaga Beach engagement photos and now with summer on the horizon I have beaches on my mind. 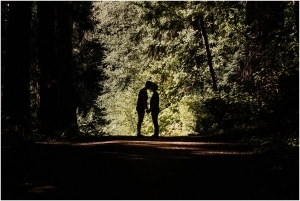 This is one of my favourite engagement sessions because not only are J&S fabulously good looking, but they’re incredible people. I love Jaclyn. Sincerely. We initially met at the South Simcoe Bridal Show, and then for coffee at Coffee Culture. We met for wine at Bistro 77 (which makes a fabulous intimate wedding reception venue btw) just the other day and I cant say enough how blessed I am to have met her – she’s genuinely amazing. You can see the original post here, but this most of the photos in this particular set were re edited for a sample album I made for the studio. I cleaned up the beach to make it appear as though they were the only 2 people that existed. I don’t often Photoshop too much, but for an art piece you can bet that I will go to great lengths to make magic (read: zap all the beach chairs… and guys in speedos… ). Besides, the way they looked at each other during their shoot clearly showed that they might as well been the only people on the beach to begin with. The sky had been moody that day – an earlier thunderstorm threatened to return, but lucky for me J&S were feeling adventurous; Mother Nature was no match for their love 😉 The ominous clouds mixed with some blue skies; that gave way to beautiful sunset; made for a super romantic date night. Jaclyn started off wearing a white dress that flowed in the breeze coming off the water. She and Steve danced a little on the sand before Jaclyn kicked off her Michael Kors wedge sandals and ran off to get her feet wet. Steve followed and neither could resist little carefree water fight! After drying off, J changed into a breezy black dress, and she and Steve laid on the warm sand. They are so effortless together that from these photos you would never know that A) they claimed to be awkward in front of the camera; and B) We had a video crew (Overstreet Media) along side us as well, filming some footage that I plan to use in a video here on my web page! 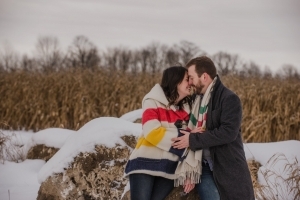 I cant wait for their wedding at Hockley Valley Resort! Book your session, or say hello here!